Derek Niven in action in the last match at Saltergate. Each week we are taking a look at some of the best to hit the net for Chesterfield over the past decades. If you have a goal you would like us to feature, email sport@derbyshiretimes.co.uk with brief details and your memories of the strike and we will try to include in a future article. Players enter the pitch at Saltergate for the last time. Among those suggested for future weeks are a Paul Holland cracker against Blackpool in the 90s and a Geoff Salmons last-minute equaliser at Hillsborough. The third golden goal in our series, Derek Niven’s 96th minute winner against Bournemouth in Chesterfield’s last match at Saltergate, was suggested by Marcia Bigg among others. 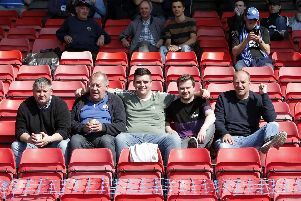 It was the 8th May in 2010 and the end of an era at the home of Chesterfield Football Club for the previous 139 years. The Spireites were off to brand new home, then called the B2net Stadium, but determined to end with a flourish and possibly enter the promotion play-offs. Sadly, results elsewhere ended those promotion hopes, but the Chesterfield players did their best to add to the carnival atmosphere — there was a parade through the town before kick-off and a special show at the Pomegranate Theatre — with a spine-tingling fightback for a memorable victory. Ian Breckin heads the ball in the last match at Saltergate. The comeback was crowned in a thrilling finale. Jack Lester had poached a second-half equaliser to cancel out already-promoted Bournemouth’s 42nd minute goal, which threatened to be a party-pooper. Then came the golden moment for Niven. The longest-serving player on the club’s books, he had fought back from testicular cancer to be a regular in the side and it was perhaps fitting that the honour of scoring the last goal at the old ground fell to the midfielder. Niven, who scored 18 goals in more than 260 league appearances for the Spireites, punished Bournemouth for failing to clear a long throw to the edge of their area. The midfielder reacted the quickest to drill a powerful low shot from 25 yards, which arrowed towards the bottom right hand corner. Cherries’ keeper Shwan Jalal fived full length, but the shot was so accurate it squeezed in by the post to spark a mini pitch invasion. Derek Niven's last-gasp winner prompted a pitch invasion. When the final whistle was blown a few seconds later, there was a total pitch invasion as fans celebrated the end of an era, made all the more memorable by Niven’s exciting finish. A true golden goal. Niven played for Stenhousemuir, Raith Rovers, Bolton Wanderers, Chesterfield, Northampton Town, Grimsby Town and Buxton, before now plying his trade at Bakewell Town. He went on to play a major part in the following season’s promotion-winning campaign for the Spireites and is also remembered for another great goal, this time a stunning strike against Manchester City in the League Cup in 2006. But more of that in a future Golden Goals feature.